A flight of steps lead up to the front door of the villa which opens onto a spacious dining area with an archway through to a comfortable sitting room with wood burning stove, digital television and DVD player. Sliding glass doors open from the sitting room to the part covered pool terrace which provides the ideal spot for outside dining. A stairway from the dining room leads to the large master bedroom with en suite bathroom. Sliding glass doors open from this bedroom onto a large terrace from where there are wide views over the surrounding countryside and roof tops to the sea. This villa has a modern, well equipped kitchen and separate utility area. The other 3 bedrooms and bathrooms are accessed via a corridor from the dining room. The villa benefits from several, wide sunny terraces by the large, heatable pool (additional cost to heat). An adjoining terrace provides a further covered seating area and there is a well planted garden and a traditional Portuguese wood oven. Air conditioning Child's highchair available on request, at additional cost. Pool heating available at additional cost. An excellent villa, very well equipped, spacious, comfortable and spotlessly clean!! Wonderful trip for my family, very well presented property, helpful agents and maid. Great outside area for barbecuing and pool, thoroughly recommend. This was another year in Carvoeiro and the villa was very comfortable. The Agent were extremly helpful and all Problems are solved immedeadly. We wood recommend the villa to our friends. This was our eighth year in Carvoeiro and this was the best Villa by far. Only 25 minute walk to the town which we did every night. We had the pool heated which was bliss. The Villa was so well equipped and so clean. The Agents were also extremely helpful. We will definitely be back! Casa Anniche - a beautiful villa. A beautiful villa which was perfect for our two families. We all loved the pool which was well maintained and the lovely Fatima came in 5 days a week to keep the place tidy. We were within walking distance of the beach and restaurants. A fantastic holiday and we would definitely recommend the villa to others. Only negative was one of the shower screens and the dishwasher door were broken and repairs promised at the beginning of our stay weren't carried out. Hemos pasado unos días maravillosos en la vivienda, en la que no hemos echado en falta nada para sentirnos como en casa. La zona es maravillosa y hay muchas actividades de ocio y cultura alrededor. 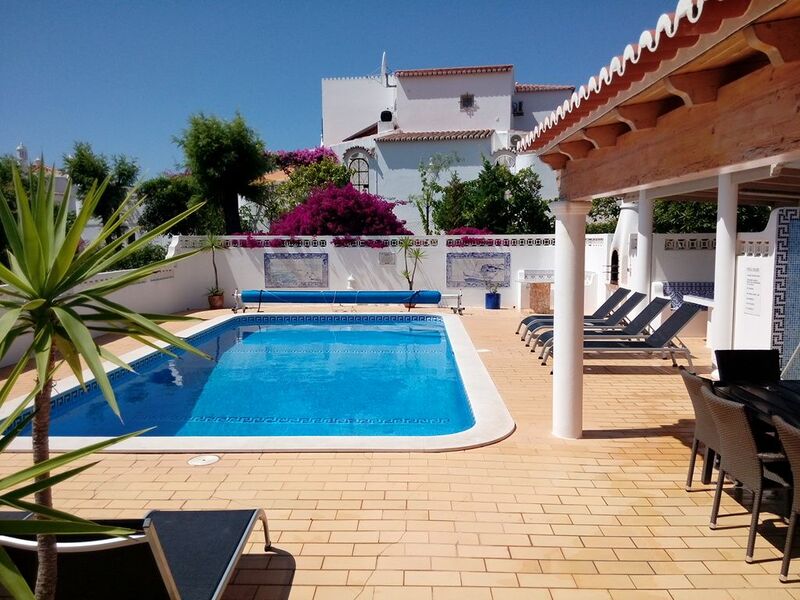 This attractive 4 bedroom Carvoeiro villa is situated within the popular residential area of Areias dos Moinhos, just 20 min walk from Carvoeiro. Casa Anniche is a particularly smart and comfortable villa and has the benefit of air-conditioning throughout at additional cost.